Not only are private investors flocking to gold, but so are central banks. It is yet another example of the indispensability of gold as a hedge against the bankster engineered economic implosion. Earlier today, the precious metal reached a new record as the dollar tumbled further on the Fed announcement it will continue its habitual manipulation of monetary policy by keeping interest rates artificially low. Gold reached $1,290.40 an ounce at 2:43 p.m., according to Bloomberg. At the same time, the beleaguered dollar fell 1.3 percent against a basket of six major currencies. Gold has surged 17 percent this year, heading for a 10th straight annual gain. Many gold advocates are stunned by the momentum and note that the market will soon reach the psychologically important $1,300 an ounce mark. Analysts believe the price will reach $1,500 by the end of December or during the early months of 2011. In addition to western central banks, a growing list of countries have been adding to their official gold reserves in order to reduce the risks associated with their U.S. dollar-denominated holdings. China, India, Russia, Mauritius, Sri Lanka, the Philippines, Kazakhstan, Venezuela, Saudi Arabia, and even Bangladesh are reporting gold purchases as a hedge against the falling value of the dollar. When central banks engage in increased gold purchases, it means they are printing more fiat paper money. “The Federal Reserve Bank no longer shares M3 money supply with the public. Therefore, the public no longer knows exactly how much money is in circulation at any one time. However, the increase in gold is a pretty good barometer of how much money is being created,” writes Nicholas Santiago. Historically, gold has been used as a hedge against severe economic conditions, so all this increased buying and hoarding of gold can be viewed as a warning signal of big trouble just up ahead. 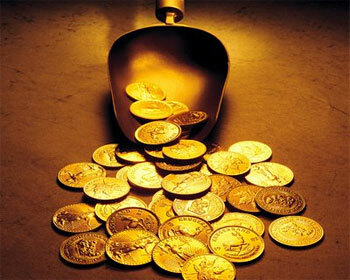 In short, if you want to protect your family and retain your wealth, gold is the place to be. Discover how the banksters hijacked the economy with the creation of the Federal Reserve. For a limited time, Midas Resources is offering a Free Silver Dollar when you purchase “The Creature from Jekyll Island” by G. Edward Griffin. Order your copy today or call Midas at 1-800-686-2237 and tell them you want to order “The Creature from Jekyll Island” with the free silver dollar.